A standing desk allows a user to stand or sit to avoid all the negative health effects of sitting while working for a prolonged period of time. Countless of studies, including one from National Center for Biotechnology Information entitled, “Taking a Stand,” have provided concrete proof that people are a lot more productive and healthier if they change their postures while working in their respective workspaces. Some of the benefits a standing workstation allows you to enjoy include an increased level of creativity and productivity; more calories burned; and enhanced focus and mental clarity. More and more people advocate for their health through the use of this type of desk. Fortunately, the market offers a good deal of options to cater to our different needs and preferences. Continue reading as we've listed the best standing desks available online, as well as some aspects that you need to consider to help you make an informed buying decision. One look and you’ll fall in love with the Airtouch™ Standing Desk. This sit stand desk offers the simplest solution for people wanting to work sitting and standing in the office. The desk has a height adjustable feature and it can be activated using a simple lever that’s fitted under the desk. The main selling point of this adjustable desk is its innovative “Airtouch” mechanism, which allows you to effortlessly adjust the height of your work surface without requiring electricity. This attractive feature of the desk encourages frequent workstyle transitions as well. 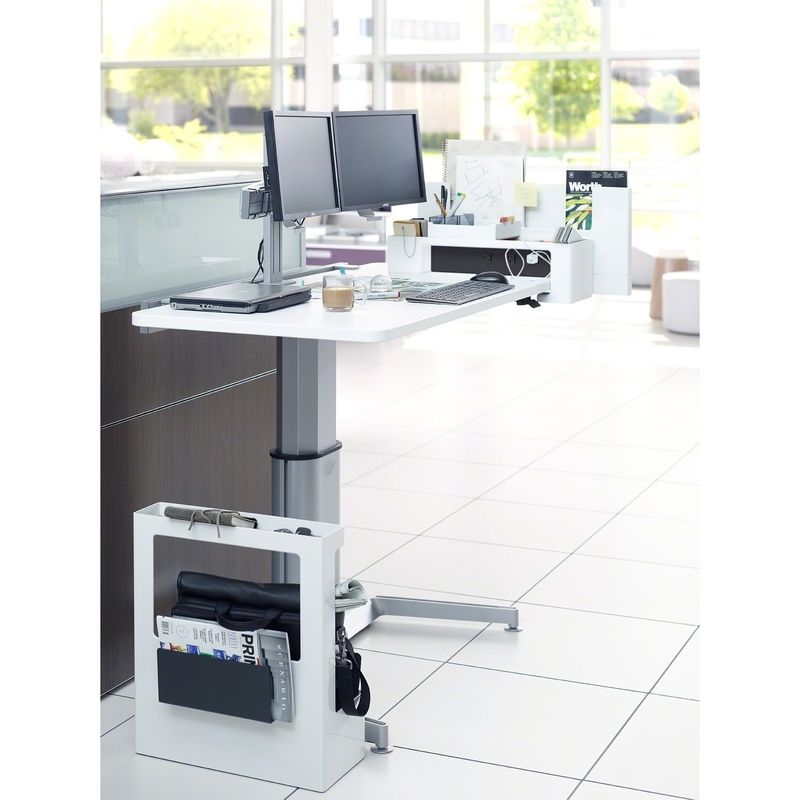 With just the lightest touch, you can adjust your worktable from 26 inches to 43 to fit your task-related or personal needs, may it be standing or sitting. Because the Airtouch Standing Desk does not require any electrical components to work, you can use it anywhere you wish. Its maximum weight capacity is 150 pounds. This electric adjustable desk from Symple Stuff is a popular and well-rounded unit. You can easily transition from standing to sitting and vice versa by just pressing a button! The height adjustment process works in just a matter of seconds. While the Elle Standing Desk is an electronic height adjustable desk, it is surprisingly cheap, making it a sought-after unit among workers across all industries from hospitals and schools to corporate offices. The affordability and convenience of the Elle Desk can set the deal for you, but you have to remember that you need close access to power for the desk to operate. If you have a standard outlet near where you'll be placing your new standing workstation, then you will definitely love this unit! Brimming with innovative features, this traditional-style stand up desk is nothing but modern! Its most notable feature which sets the desk apart from all other units available on the market is its intuitive height control mechanism. Just a few taps on its programmable memory controller and your desk will move up and down, depending on your favored height. Even with its 150 lb. lift capacity, beautiful merlot finish, metal accents, and fluted crown top, it's most known for its ultra-low noise production. It comes in the size, 32" H x 54" W x 30" D, with 2 USB and power outlets, so you can easily charge your other devices. Really enticing, isn’t it? The Move 80 Series Standing Desk of Bush Business Furniture is a stunning desk with its steel legs and Natural Cherry finish. It's the standing desk that takes the classic look of fixed tables with an added functionality. This unit carries with it amazing features to go with the desk's good looks, including a silent motor that decreases and increases the height of the desk. The table is also resistant to spills and stains, and it has been certified by several organizations including BIFMA and ANSI. As the height is adjustable and can be altered, it's as good option for multiple users, most especially when its memory is capable of storing 4 height settings. As it's included in the list of the best standing desks currently available for purchase online, it’s no surprise that the Jarvis Bamboo Standing Desk is a popular unit. It offers great value for a fully electric standing desk as it’s stable, beautiful, and of high quality. What’s more, you have a ton of freedom in choosing the additional features of your desk including the tabletop’s shape. It is also backed by Fully, a reputable company, as well as a comprehensive warranty. Above all that, it is priced competitively with its starting price of $655. The bamboo material that comes with the Jarvis Standing Desk makes the unit environmentally friendly. Bamboo requires/uses no pesticides or fertilizers. In fact, it is likely that you know it’s an eco-friendly material that grows extremely fast. The tabletop material and the solid construction of the entire unit makes the Jarvis Greenguard certified, so, yes, this incredible desk is free of any VOCs! The Xdesk Terra Standing Desk is made by a company that’s among the first ones that pioneered the use and production of standing desks. Xdesk, the manufacturer, isn’t a purveyor of regular, mass-produced desks. But, it custom builds models according to the desires of every single customer. This means your Terra Desk will have unique accessories and features that you’ve chosen for yourself. With the desk, you’ll have a workstation that's truly one-of-a-kind. The Xdesk Terra shines as it has a superior build quality, sturdy construction, and gorgeous design. Yes, even when you’ve customized the unit. With the desk’s bamboo top, you won't just have a work surface that’s stunningly beautiful, you’ll also have one that’s durable; perhaps the most durable you’ll see for a long time! Get the firsthand taste and custom-design your own Terra desk today. Uplift Desk is quite popular alongside Jarvis, which has similar features. We tested out the desk ourselves to compare its quality to the available alternatives and see whether it offers good value or it’s just one of those desks that are hyped up. After using the Uplift Desk for weeks, we’re 100% sure of the fact that it’s of premium quality. We saw what the fuss was about. As you already know, it’s a height adjustable desk. But, unlike cheap, flimsy units, the Uplift Desk stood up to our stability and durability tests. We’ve also found out that the desk doesn’t just move quietly, but it’s fast, too, even when you load up your entire equipment on the Greenguard-certified tabletop. It has dual motors so the desk is really worth investing into. The last product on our list is Updesk Pro SquaredUp, a corner standing desk that's designed with the needs of the working class in mind. With this desk, you get to enjoy space savings, as well as a durable high-pressure desktop supported by strong mounting brackets. It's easy to assemble, and the desk has augmented columns to ensure that you have a workstation that’s strong and stable. The best part? Its energy-saving control system! The Smart Desk Controller of the Pro SquaredUp has an automatic drive with four presets as well. It offers you the ability to control your desk's settings with your Android or iOS smartphone. Cool, right? It also gives you options for its finish to ensure your table isn’t just functional, but fashionable, too! This desk is the best choice if you’re on the lookout for a desk that can impress! If you haven't made up your mind yet, read on as we'll help you narrow down your options. Manual - A manual standing desk is a good option for those who don't want to spend a lot of money for a height-adjustable workstation. It's not run by a motor, but with a crank instead. It typically offers customizable options for the framework and tabletop material. Electric - An electric height adjustable desk is costlier compared to a manual standing desk, but it excels in both beauty and functionality. A touch of a button will lift the table and bring it down when needed. Are you a health advocate? Pair an electric standing desk with a treadmill and you get the ultimate work area! Ergonomic products for commercial and residential use are designed to ensure your workday is as comfortable and convenient as possible. If you share your office with other people and you use a noisy standing desk, it won't be long before your co-workers complain about the sound that's made by the lever or motor of your desk. So, you have to double check on the sound level of your chosen standing desk for you and your coworkers' sake. Somewhere in the range of 65 dB or less is ideal. Just like with anything you purchase online, your standing desk should come with the best warranty especially if it has lots of motorized parts. Compare the warranty and policies of desks and choose the one that gives you a full coverage. With that said, you need comprehensive terms for the desk's frame, surface, control panel, and motor/s. Regardless of what you mount on your desk, it should be sturdy and stable. A durable desk will allow you to work on any task without fearing of collapse or breakage. The most common desktop material options include solid bamboo, reclaimed wood, solid wood, metal, laminate, and veneer. The more durable a desktop material is, the costlier it will be. Not all standing desks have a great fit for your shape and size. Most of the standing desks we've featured cater to adults with an average height and weight. If you're taller or shorter than average or you have a height of more than 185 cm or less than 165 cm, you need a sit stand desk that allows you to position your arms at the right angle as you use the keyboard. So, opt for an electric desk that extends at a comfortable height. Measure the distance between your toes and your stomach as that will be the best height for your standing desk. Although it's not mandatory, an anti-fatigue mat will ensure you work on your feet without experiencing any fatigue. It's not included in a standing desk package, but you'll be able to find a lot of options on Amazon for just a couple of bucks. A specialized mat has contours which allow the user to keep changing from different positions in the most natural way.